Wilsonville walked away with the 53-7 win. It was one of the most dominant games of the season for Wilsonville, who pulled away from the no. 4 ranked team over the course of the game. 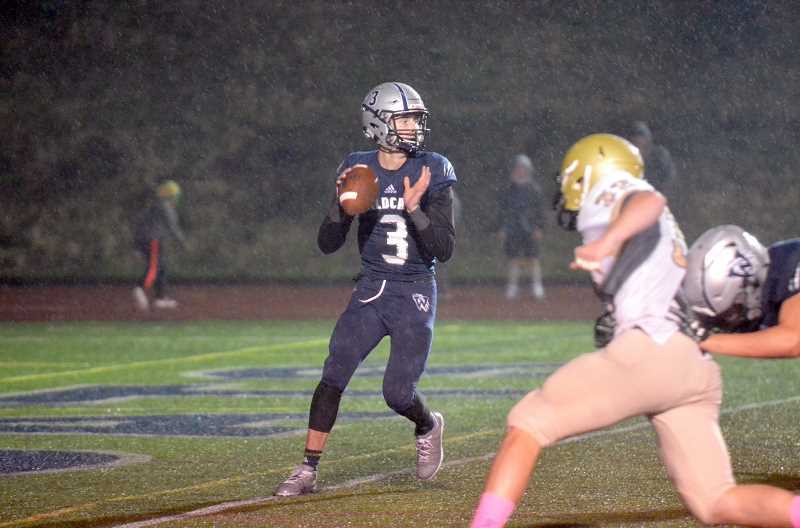 Wilsonville senior quarterback Nathan Overholt was in excellent form, scoring seven touchdowns through the air to various receivers and scrambling for one of his own. The Wilsonville defense also got points on the board, with senior Kevin Burke intercepting Pendleton quarterback Trent Sorey and returning the ball for the final touchdown of the game. "Any team takes pride in putting up yardage for the defense," senior linebacker Kalei Kauhi said after the game. Kauhi led the team with 11 total tackles on the night. "We take pride in ours. We have a little competition going with the offense right now. Obviously they're winning, but we try." One of the top moments of the game for the Wildcats was also indicative of the game as a whole. Overholt motioned the tight end to the right side of the line, leaving sophomore and younger brother Chad Overholt uncovered on the left side. The younger Overholt ran the wheel route, caught his quarterback's pass over top of the nearest defender and ran it to the house for the 71-yard touchdown at 11:45 of the third quarter. "We're confident in our guys one-on-one," Nathan Overholt said. "We didn't know it was going to be there, but we knew we were going to take what they gave us. We knew our guys were going to be open one way or another, whether it was underneath, over the top, whatever. Tonight it was over the top." All-purpose senior Cooper Mootz, senior wide receivers Sam Westing and Jonah Gomez also all had touchdowns of their own. Mootz, who last year was the main running threat for the Wildcats, has been turned into a threat through the air as well. "I wouldn't say we planned it, but we know Cooper is capable of doing anything on the field," Overholt said. "He's an all-purpose back ... Even though he hadn't shown it in the past, we just knew he was that type of guy." Wilsonville heads into the playoffs with a record of 9-0 and as the Special District 1 league champions, and will host the No. 16 Ridgeview Ravens (4-5) Friday, Nov. 2. Pendleton meanwhile falls to 8-1, and enters the post season as the No. 3 seed. The Buckeroos will face off against Crescent Valley (6-3) on the same day. "It's always a good feeling," Kauhi said. "We just want to continue to get better every day as we go into the future."